There is no rule that says all of your countertops need to be made from the same natural stone. Feel free to use granite on your anchored countertops and marble on your kitchen island. A double-ogee edge (or another custom-cut edge) that adds energy and sophistication to your countertop's edges and corners. All marble, all the time. 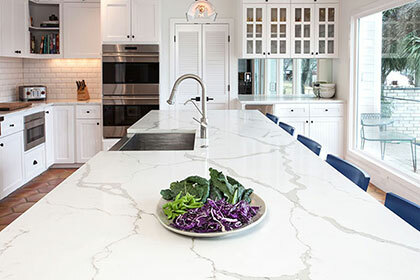 If you really want to add elegance to your kitchen, you can work with your marble countertop fabricator in St. Louis to cover your kitchen in marble. Together, you can create a custom look by covering the main countertops, island and backsplash with beautiful marble. Most people think marble is a white natural stone. Truth is, it comes in an array of fabulous colors, which allow you to be creative with your kitchen. Think about white cabinets and cupboards combined with stunning gray marble countertops. No one who ever visits your house would see it coming–and they would surely never forget it.